I finally got around to baking an apple pie with the last of my homegrown Granny Smith apples. If you try this recipe, you’ll probably never want to eat an apple pie from the store again. There is no comparison. There is nothing like a homemade apple pie fresh from the oven. Mix dry ingredients. Using a pastry blender, cut in the shortening until thoroughly blended. Add water with stirring until dough forms a ball and sticks to fork. Roll out dough on a floured pastry board. Fold in quarters and transfer to a 9″ pie pan. Unfold the crust and flute/crimp the edges. Peel and core the apples, and cut into eighths. Squeeze lemon juice over apples to prevent browning. Mix sugar and spices and sprinkle over apples. Put sweetened apple slices into pie crust. Blend topping ingredients together until crumbly and spread over the top of the apples. Bake pie at 400 degrees F for 35-40 minutes. Serve warm with vanilla ice cream, or Vermont cheddar cheese. Be sure to check out my newspaper column that’s coming out in the Huntington Beach Independent this Thursday. It’s on heirloom apples. See it at www.hbindependent.com/opinion. Gary Paul Nabhan, one of the founders of Renewing America’s Food Traditions (RAFT) has declared 2010 as the Year of the Heirloom Apple to publicize the decline in our national heritage of apple varieties. Sadly, out of America’s 15,000 historic apple varieties, only about 3,500 are still commercially available. Like most endangered foods, we can save them by eating them. Create demand for heirloom apples by seeking them out and buying them. If you can find Wealthy or Northern Spy apples, they make fantastic pies. I speak from experience about the Northern Spies, but I have yet to find any Wealthy apples to try. If you haven’t read it yet, I highly recommend “Renewing America’s Food Traditions: Saving and savoring the continent’s most endangered foods.” The book lists 108 hard-to-find apple varieties that are worthy of searching out. Look for heirloom apples at your farmer’s market or local U-pick orchards. They’re still out there. Go find them! 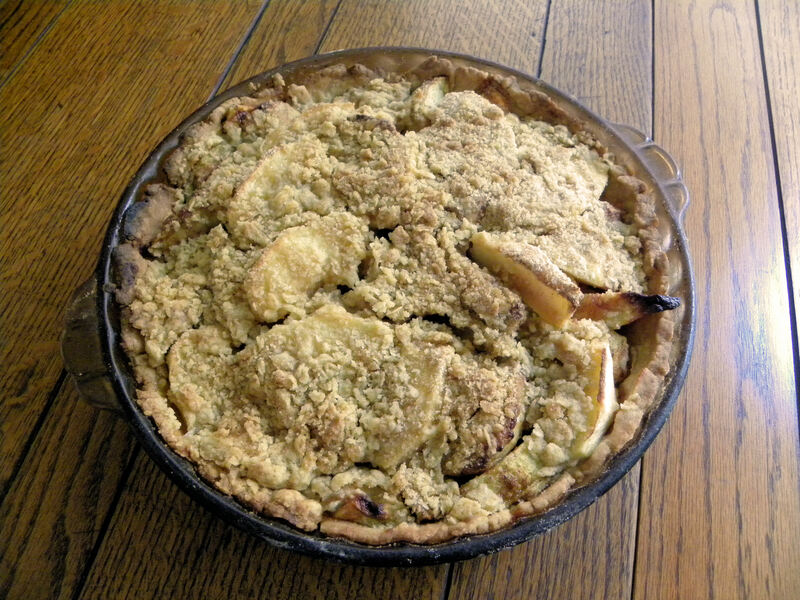 This entry was posted in Uncategorized and tagged apple pie, apples, heirloom, RAFT, recipe. Bookmark the permalink. Today you are making me drool as I also read your Harvest Monday post today. I still haven’t made pie this season. I really ought to buy some apples at the FM today and make pie. Daphne, give this apple pie recipe a try. You just can’t beat it. Hi Lou, that recipe sounds delicious and I can’t wait to try it. There’s a move to rejuvenate heritage varieties in Germany, too, also including a revival of certain traditional species of pigs that had almost died out due to large-scale commercial pork production. Many chef cooks at good restaurants are using such heritage products, which is excellent advertising for them of course. Hi Barbara. I hope you give the apple pie recipe a try. Have you heard about the seed bank in Russia that is going to be bulldozed to make room for housing? It has thousands of heirloom apples found nowhere else, plus tens of thousands of other plants and seeds. Sad. Major loss if it happens.